ST Genevieve’s is celebrating a league and cup double success after an outstanding number of days for their basketballers at the West Belfast school. 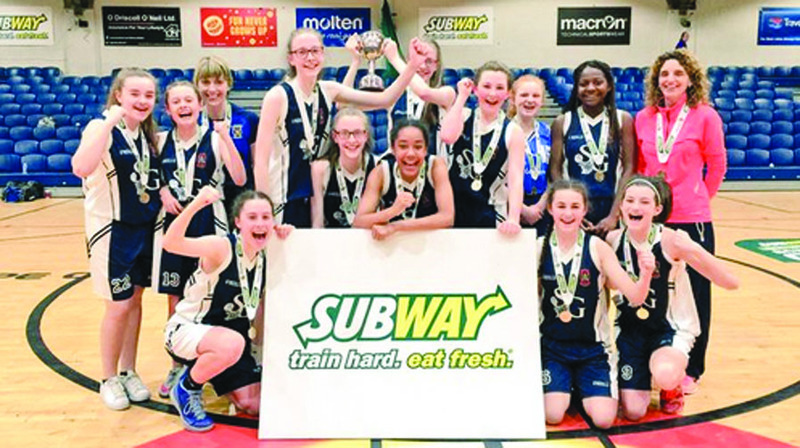 The girls clinched the Junior B league title last Thursday before becoming the last team standing in the Subway All Ireland Schools U15B Girls Cup as they beat Pobalscoil Chorca Dhuibhne 43-31 in the final at the National Basketball Arena to secure the third cup in their history. Pobalscoil Chorca Dhuibhne had the measure of the earlier exchanges with Niamh Ní Chonchúir and Ciara Furlong going strong to the basket for five points apiece inside the first seven minutes. A 6-0 put them ahead after three minutes and despite the pace and accuracy of St Genevieve’s Lara Dahunsi, the Kerry side led 10-9 for the first quarter. The lead changed hands on seven occasions during the first half as Corca Dhuibhne’s Niamh de Brún and Ceití Ní Lúing netted before Fiona Connolly and Naoise Burns started to heat up for St Genevieve’s. A 6-0 run for the Belfast girls ensured control of the game and a 21-14 lead at half-time. St Genevieve’s won the game by 12 points and they reached that margin early in the third quarter. It was another 6-0 run, this time featuring two of the Turley quadruplets – Cora Turley blocked down and fed Connolly with the outlet pass in a traversing play that found Aoife Turley on the baseline. Her jump shot sailed in and St Genevieve’s had the lead out to 16 points by the end of the third quarter. Pobalscoil Chorca Dhuibhne went full tilt in the fourth quarter with a determined Niamh Ní Chonchúir taking her tally to a game high 15 points. Seven minutes wasn’t long enough to haul back the deficit, but both sides could walk off the court knowing they’d given it their all in a national final. The win was the perfect follow up to victory in last year’s U14 competition, much to the delight of winning coach Sinead Carabine. “Things have really come together for the school and we’ve gotten great support,” she said. “They started to see their plays once they got level and hit their stride in the second quarter. The winning coach was also full of praise for the team’s improvement this year which she owes much to the hard work and dedication by the girls. “This year the girls have worked really hard and they have improved leaps and bounds since last year,” she explained. “We have an American girl who played at a very high level and I think she has really brought the rest of the girls on a par with her now. “She has encouraged them to train harder and it’s really elevated the team as a whole. “They’ve really put the work in and you can see the difference in their game and it’s all paid off for them. “They wanted it badly and you could see that in their performance, with being in control in both games for the most part. Sinead also praised the support from everyone at the school and said there has been a great buzz around the place since securing the double success on Monday. “The reaction at the school has been brilliant between the staff and the kids,” said a delighted Sinead. “Everyone has been so supportive and there is a lovely atmosphere around the school. “There were plenty of teachers who went down to support the team at the National Basketball Arena in Dublin and it was great to have all that support from everyone. The winning coach is also looking ahead to next year already and is hopeful that the team can make the step up to Division A and compete. “We move up to Division A next year and I feel we can more than compete in it. Speaking at the trophy presentation, Muriel O’Grady, Development Agent Subway Ireland congratulated the side on their victory. “Congratulations to the newly crowned Subway All-Ireland Schools’ Cup champions, St Genevieve’s High School, who defeated, Pobalscoil Chorca Dhuibhne in an exciting final.